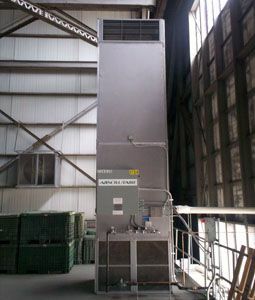 Langley Air Force Base, located in Hampton, VA, needed new equipment to replace old and failing hot water space heaters and the main boiler in the Air Forces Readiness Hangar. They had not had heat in the space for approximately ten years. The facility is used to store backpacks for troops if and when they need to deploy quickly during war time. The Air Force Base chose five AbsolutAire E-Series direct-fired air turnover units to heat the space. Since the hangar simply houses supplies and doesn't see a lot of foot or vehicle traffic, there wasn't a need to replace any foul air in the space. The warm building air mixes with the 3% OA that the E-Series requires, and provides enough heat to keep the supplies from freezing during the winter. And since most of the supply air is already warm building air, the units help keep heating costs down.